Finn Balor defeated Kevin Owens to win the NXT Title. Plus the Gentlemanly Grapplers, The Vaudevillians, were victorious in their voyage to the #1 Contendership to the Tag Team Titless. They started the show by airing a video package on Beast in the East and announced that they will air the NXT Title match, in its entirety, later tonight. Sasha is now a baby face for some reason. Sasha has no friends, so she was ready to go 2-on-1 with her opponents when Charlotte came down and made herself Sasha's partner so she could get at Dana. See they could have combined the WWE and NXT story lines and had Paige come out, but WWE doesn't think that far ahead. I fully expected this to turn into a 3-on-1 beat down on Charlotte, but I was wrong. Oh well. Sasha and Charlotte did some of their team moves, but the heels took down Charlotte and got the heat on the former champion. Emma and Dana did that really annoying thing The Ascension used to do where they rapidly tag in and out for like 30 seconds. That is just ridiculous. The fans can't figure out if they want Sasha or not. Anyway Sasha got the hot tag and went wild on her fighting female foes and eventually won with the Bank Statement on Dana Brooke while Charlotte had the Figure Eight on Emma. After the match, Charlotte challenged Sasha to a title match next week, since Sasha promised it in exchange for being her partner tonight. Sasha accepted it and we have a rematch from December next week. - Bayley was at an NXT Live Event this past weekend and commented that Emma broke her hand. She stated that she is going to come back from injury and win the Women's Title. This is the second injury Bayley has had in 6 months and the second time she has promised to come back and win the belt. This was, obviously, the match from Saturday in Tokyo. This was an excellent match from beginning to end. The only funny thing is they literally just aired Beast in the East as the lead in to this episode of NXT. Anyway, the King is dead, long live the new King of NXT. Owens was asked afterwards how he feels about losing and Owens shoved the camera away. - Chad Gable said Jason Jordan doesn't want to win and doesn't want to dominate and that's why he hadn't agreed to be his partner. Jordan walked in and finally agreed to be his partner next week. - Solomon Crowe is back. He is meaner, badder and nastier than ever before. Marcus Louis is back too. He got his head shaved at NXT Takeover: Fatal 4-Way on September 11, 2014. Neither the hair on top of his head nor his eyebrows have grown back yet. Crowe almost won by pinfall and then by submission in the first 30 seconds of the match. Crowe went for a Springboard Something, but Louis hit the ropes and Crowe fell stomach first on the top rope. Louis locked on a kneeling Abdominal Stretch and did the claw hold on Crowe's ribs, but Crowe fought out of it. Crowe used a Twist of Fate, which was called a Unique Maneuver, the CM Punk running knee and won with the Crowe Bar. 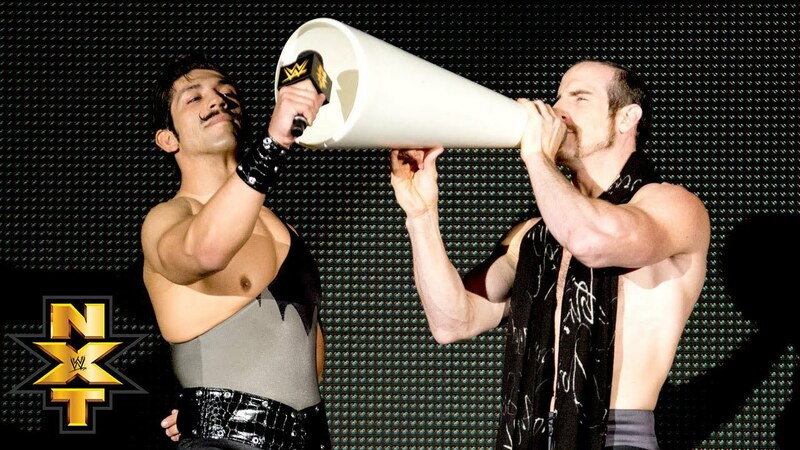 - The Vaudevillians vowed to be victorious over the villainous vagabonds Enzo and Cass. - Balor celebrated winning the title last week by standing against a wall with Cesaro and Neville until John Cena congratulated him. He looked like such a geek with a look like “OMG! He talked to me!” on his face. - Next week: An update on Sami Zayn. Trivia Time! The Vaudevillians were the first team to ever lose to Wesley Blake and Buddy Murphy. Blake and Murphy beat them so bad that they got the confidence to win the tag titles the very next week. Also when Enzo Amore had a broken leg, Colin Cassidy's only feud was losing over and over again to Aiden English. Now that we have had Trivia Time, it is now MAIN EVENT TIME! Fast paced grappling early on with Enzo and Cass in control through the commercial break. Aiden got the heat on Enzo when Amore goofed around and ran into the feet of NXT's resident opera singer. The Gentlemanly Grapplers had their way with Enzo until Enzo almost literally fell into a hot tag. Cass gave Aiden the big boot and Simon the Black Hole Slam. Finally they went for the Rocket Launcher, but Simon tackled Colin out of the ring and Aiden rolled through a flying cross body from Enzo and scored the shocking win! The Vaudevillians now get their shot at redemption! They now get their show at Blake and Murphy and the Tag Team Titles. That does it for this week, until next week, remember to say your vitamins and take your prayers!